Voter turnout is increasingly becoming top of mind as the 2020 election cycle begins. In the 2018 midterm elections, about 49% of the 235 million eligible voters in the United States cast their ballots. Many of the exceedingly close midterm races were won or lost by less than the number of Limited English Proficient (LEP) voters in the race’s district. LEP voters can make or break an election, and supporting LEP voter turnout can help to improve participation in your district’s elections. There are a number of ways to support LEP voter turnout, and therefore your district’s voter turnout. There are many nonprofit organizations that are working to increase LEP voter turnout and support LEP populations in general. These nonprofits have become increasingly popular since the 2016 election, as immigration has continued to become a major political issue. If you want to register more immigrant voters and see improved LEP voter turnout, these nonprofits can help you achieve that goal. One of the best ways to prepare to meet the needs of your LEP constituents, and to improve LEP voter turnout and participation, is to get involved with the LEP communities in your district. If you begin reaching out to your LEP communities now, you’ll know what languages you need to translate your election materials into when it comes time for the election. This also helps build rapport with your LEP communities, showing that you care about their needs, which supports higher turnout rates. Ensure that you know which threshold languages you need to translate your election materials into, and start having conversations with your Language Service Provider (LSP) now. Translating your documents improves the ability of your LEP constituents to understand how the election process works, how to register to vote, and how to participate in voting. If you don’t know what your threshold languages are, the regulations lay out how to determine which languages are your district’s threshold languages. Early voting laws are not in place in all 50 states, and those with early voting laws often fail to make them accessible to LEP voters. Make sure your early voting locations include the areas in your district that are predominantly made up of LEP voters. Increasing access to early voting, and guiding LEP constituents as to how to vote early or how to mail in their ballots if they aren’t in the immediate area, can increase the overall LEP voter turnout. Clarifying the identification requirements in your district can support LEP voter turnout as well. States with photo identification requirements tend to see fewer LEP voters, or their LEP voters are turned away at the polls. If you have identification requirements for your district’s polling places, be sure to clearly express that in your threshold languages to prevent LEP voters from being turned away. Increasing LEP voter turnout goes hand-in-hand with your language access goals and increasing voter turnout as a whole. 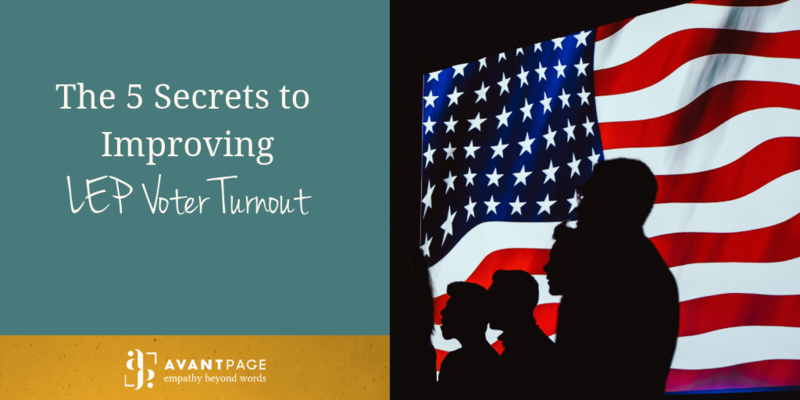 If you want to improve LEP voter turnout in your district, we can help. Give us a call at 530-750-2040 or request a free quote today, we can get you prepared for the 2020 election.